There is an ongoing debate among youth sociologists on whether transition processes still take the form of traditional sequences or diverge from conventional patterns. Traditional transitions are generally described as smooth processes that follow institutionally predictable, linear pathways from school to work (Evans K, Heinz W. Becoming adults in England and Germany. Anglo-German Foundation, London, 1994). Young people may, however, diverge from linear trajectories by experiencing periods of unemployment, shifting between different employment statuses or by changing direction. The discussion centres on whether shifting transitions are caused by a desire to try alternative pathways or if structural conditions are forcing young people into precarious situations. In this chapter, TIES Survey is analyzed using an advance methodology called Latent Class Analysis and a typology is developed based on how respondents’ transitions proceeded after leaving school. Next using biographical interviews; the typology is elaborated and revised according to the motivations and experiences of respondents. The chapter shows that almost all of the respondents in this study were motivated to seek stability in the labour market and wanted to pursue institutionally defined “traditional pathways”, prompted by both labour market conditions and job insecurity. Personal experiences of instability motivated them to stick at a job once they had secured a permanent position. Lack of security dragged other respondents into shifting transitions, not out of choice but born of necessity. There is an ongoing debate among youth sociologists on whether transition processes still take the form of traditional sequences or diverge from conventional patterns. Traditional transitions are generally described as smooth processes that follow institutionally predictable, linear pathways from school to work (Evans and Heinz 1994). Young people may, however, diverge from linear trajectories by experiencing periods of unemployment, shifting between different employment statuses or by changing direction, contrary to expectations created by their previous trajectory. The discussion centres on whether shifting transitions are caused by a desire to try alternative pathways or if structural conditions are forcing young people into precarious situations. So far I have pursued a retrospective approach to understanding youth transitions, showing that transitions are to some extent pre-conditioned by educational stratification, whereby young people develop distinct compositions and volumes of capital in distinct institutional settings and are exposed to different structures. Their transitions may be further shaped by early exposure to the labour market through various combinations of work and study. The previous chapter introduced the idea of social trajectories, during which young people develop different forms and volumes of capital required for their transitions. The comparative analysis showed differences between the settings: in Amsterdam, young people who were able to develop different forms of capital during their vocational or academic tracks could utilize these resources during their transitions, while, in Strasbourg, youngsters unable to develop such resources had to resort to low-skilled jobs, even if they had a diploma. I will now go one step further by studying how the trajectories of native-born descendants of immigrants from Turkey developed after they left education. The most common way to study school-to-work transitions is by looking at the time it takes to find one’s first job. The analysis of the TIES Survey by Lessard-Phillips et al. (2012) revealed that in Strasbourg it took native-born descendants of immigrants from Turkey 3.56 mean months to find their first job while the comparison group took 3.38 months. The figures for Amsterdam were 2.10 mean months for the descendants of Turkish immigrants versus 1.70 for the comparison group. This is a very short time span in both cases and does not provide much variance when analyzing the time taken to start one’s first job. I therefore focused on how the respondents’ transitions had developed up until the time of the TIES Survey and the qualitative interviews, taking into account each respondent’s entire (job) trajectory. Using both the TIES Survey and the qualitative interviews, I developed a typology for how the respondents’ transitions developed during periods of activity and inactivity. Before I go into the findings in more detail, I will present typologies from the previous literature that informed the development of my typology. A few significant studies contain typologies of transition patterns that seek to explain the changing nature of youth transitions today. In the YOYO project, a comparative study of youth policy and participation in nine European countries, Plug and du-Bois Reymond (2003) created transition types based on the “complexity” of the transition pattern and the “length and direction of the transition period” (p. 108). YOYO research used qualitative data collected from young people who had signed up with youth centres, which offer assistance to young people to get their transitions back on track. Using biographical interviews, the researchers came up with six types: the first type is “smooth” transitions, in which young people made a smooth transition into the labour market following the institutional logic, while in “stagnant”, “downward” and “institutionally repaired” transitions, they experienced unemployment, instability and even social exclusion (in the case of stagnant transitions). The authors also acknowledge a positive type of “alternative” transition whereby young people achieve upward mobility despite circumventing institutional logic, by applying active choices and strategies. Du-Bois Reymond had already described such young people as “trendsetters”, (du Bois-Reymond 1998) who “aim to incorporate their personal lifestyles into their working lives” (p. 67). Even though the study was carried out in different countries, the authors did not draw any context-related conclusions and their conclusions paid little attention to social class and gender differences. In their study of youth transitions in Bristol (UK), Bradley and Devadason (2008) developed a typology for young people’s early labour market careers to determine whether youth transitions had become “de-standardized”. This study focused on one setting, using a purposeful sampling strategy that took account of social class differences, gender and ethnicity. On the basis of qualitative interviews, the authors analyzed whether young people were experiencing unstable careers that fluctuated between periods of employment, unemployment and inactivity, or whether their career paths simply took a while to stabilize after graduation. Their typology contains four different types: “stickers”, “shifters”, “settlers” and “switchers”. The first type, “stickers”, refers to youngsters who had a specific career objective soon after leaving education. Stickers are not stuck in their job, but they settle in a career after shifting between a few jobs or statuses. In that sense, stickers are similar to the smooth transitions defined in the YOYO study. Bradley and Devadason’s (2008) next category are “shifters”; young people who have intermittent periods of employment, training, unemployment, part-time jobs and travel and who have not yet settled into a long-term career or job. Although the authors emphasize that shifters might “actively make choices rather than reactively respond to labour market conditions” (p. 123), being a shifter also has negative connotations as an inability to settle down in a career may be due to labour market conditions rather than personal choice. Such transitions may be perceived as being similar to the “downward or stagnant transitions” in the YOYO study. In order to incorporate the element of “choice” or agency in their typologies, the Bristol study proposed two other types: “settlers” and “switchers”. Settlers make a conscious decision to settle down in a career, sometimes accompanied by starting a family, while switchers may travel, return to education or embark on a new occupation. The switcher category is thus closest to the description of “alternative” transitions in the YOYO study. Taking account of the variance of social class, ethnicity and gender, the researchers found that women were more likely than men to be shifters and that married men were mostly found in sticker careers, which are more stable and traditional, although this did not apply to married women. The authors’ explanation was that women’s “traditional pattern of less stable market involvement” was contestably associated with having the “freedom to shift” (Bradley and Devadason 2008, p. 124) while acknowledging that the situation is more complicated for women. They found both highly-educated and low-educated respondents in all of the pathways; hence they were not able to connect one type to a specific group. Based on the qualitative interviews they suggested that young people have somehow internalized today’s labour market insecurities and perceive them as being part and parcel of their everyday reality (Bradley and Devadason 2008, p. 133). Both studies interpret divergence from traditional or linear trajectories as having both negative and positive outcomes. They suggest why some young people experience shifts and non-traditional transitions while others don’t, and how transition trajectories are configured by both structural settings and individual motivations. Although both studies “mentioned” ethnic minorities, they did not draw any conclusions in this regard due to sampling issues. Bradley and Devadason (2008) showed that ethnic minority youth were more represented in shifting careers. In the YOYO study, Plug and Du-Bois (2003) developed an additional category called “other” transitions in order to categorize cases which were unclear or had not yet developed. It was into this category that they placed a group of Roma girls from Portugal, who were “difficult to classify” because “they were subject to norms and structures that were fundamentally different from the standard model of youth transitions” (p. 121). The authors found it difficult to classify these girls’ transitions since they seemed to be well-integrated within their “ethnic” community but experienced exclusion from “normal” modern educational and occupational careers as they got married very young and then dropped out of education and the labour market. However, in an early comparative study, Evans and Heinz (1994) show that, for some young women from a working class background in the UK, having a child and settling down was an active strategy to transition to adulthood in the face of stagnant careers, unemployment, or educational drop-out. Both the differences between countries when it comes to shaping transitions and the position of descendants of migrants are left unexplored by these prominent typologies. Concentrating solely on the descendants of Algerian migrants in Lyon, Santelli (2012), pursued a different transition typology, one which was not informed by the debates on youth transitions. She concentrated on whether the descendants of migrants ended up reproducing their parents’ initial conditions, using categories like “stable employed”, “socially excluded”, “insecure moving towards emancipation”, “invisible proletarians” and “insecure graduates” (Santelli 2012). She didn’t identify any dominant pattern and her sample was almost equally distributed among the five categories she had defined. Only two-fifths had achieved stable careers: those in stable transitions and the invisible proletariats, who had reproduced their fathers’ conditions through clinging on to their jobs. Santelli’s (2012) study is also inspiring in that it doesn’t only focus on youngsters who were active in the labour market. From this brief look at studies on typologies, we can see that the studies conducted so far have either focused on group issues, addressing social class and gender differences but excluding those not active on the labour market, or have focussed solely on ethnic groups within one setting, without drawing any further conclusions about institutional structures. Below I have constructed a transition typology for native-born descendants of immigrants from Turkey, taking into account both the institutional and social structures that shape their transitions both in and out of the labour market. In fact, ideas on what constitutes an acceptable transition appear to vary according to an individual’s social milieu, habitus, access to forms of capital, and in particular, the structural and institutional settings in which their transitions are situated. In order to emphasize the importance of comparative structural differences, this chapter will first explore transition patterns in both cities among both the subject and comparison groups in the survey data. In looking at how the respondents’ transitions had turned out, I will concentrate only on respondents who had left school and exclude those who were still studying. First, I will utilize the TIES data to map different labour market trajectories using a technique called latent class analysis. This quantitative method explores clusters in the data set in a descriptive way. The mechanisms behind these clusters will then be explored on the basis of the qualitative interviews. This will highlight the various complex structural and individual factors that interact to shape the transitions of native-born descendants of immigrants in both cities. To explore the different patterns of transitions in Amsterdam and Strasbourg, the TIES survey was analyzed using latent class analysis (LCA). Latent class analysis is an exploratory method for creating typologies without imposing an arbitrary typology. It categorizes respondents based on similarities of behavioural patterns or experiences, depending on their answers to selected categorical variables (McCuthcheon 1987; Yang 2006). The main objective is to cluster respondents into categories while identifying the variables that make them fit into these categories (Hagenaars and McCutcheon 2002). This makes it possible to identify a multidimensional discrete latent variable from a cross-classification of two or more categorical variables. The latent class analysis model is a form of factor analysis that uses categorical data. I therefore applied LCA to the TIES data in order to derive empirical clusters. First, a number of categorical variables were selected that provided detailed information on the respondents’ job histories. This sample was then limited to respondents who had left education and included both the native-born descendants of immigrants from Turkey and the comparison group. Separate analyses were conducted for currently active and inactive respondents and for respondents in Amsterdam and in Strasbourg. The same set of variables was selected from the Amsterdam and Strasbourg TIES datasets to predict the latent class variables. Based on the literature review, we can talk about two main pathways: one follows smooth or traditional transitions, while the other shifts between different statuses. Both of these pathways might result from either personal motivations or structural conditions. Although the majority of respondents in the qualitative interviews emphasized that they wanted to achieve stable working arrangements, not all of them were able to do so. Therefore, the analysis of active respondents included variables that would inform the typology with regard to the stability of their current position. Fenton and Dermott (2006) analyzed the number of jobs young people had had since leaving school to explore labour market stability, controlling for years of schooling, job characteristics and education level to understand the nature of job switching. The analysis in this study takes the number of full-time jobs since leaving school, the number of years since schooling and the duration of the current employment as proxies for frequency of job change. It also includes whether respondents were offered permanent contracts or promotions as measures of job stability. Finally, it includes subjective appraisal and future plan variables, such as whether respondents were content with how their careers had turned out or their plans for the future in order to assess career pathway satisfaction. The analysis among inactive respondents includes both job seekers and people who were not looking for work. The variables for this group were chosen in an attempt to understand the nature of its members’ status and if their unemployment was long-term. They include whether the inactive respondents had left school 5 years ago or longer; whether they had been unemployed for 12 months or longer; whether they had been employed previously, and whether they were also occupied with household tasks. An additional variable inquired regarding their plans for the future is whether they were planning on finding a job, studying or remaining inactive on the labour market. This variable assessed whether respondents were satisfied with their inactive status at the time of the interview and if they had clear-cut plans for the future. Once these variables were put into the models, latent class analysis classified the respondents into different clusters. A model postulating three latent classes fits the data adequately for all four analyses (see Table 5.7 in the Appendix). This decision was based on both the best model fit statistics (AIC, BIC, and chi square significance levels) and the most sensible and substantive interpretation. Even if we do not initially know the actual size and nature of these classes, latent class analysis facilitates the inference of such clustering based on similarities in the responses (Hagenaars and Mccutcheon 2002; McCutcheon 1987). Furthermore, the analysis enables us to estimate the proportion of cases in each class, each individual’s probability of belonging to a certain class, and the most prevalent classes. In the following section, we will elaborate on the results of our modelling. Tables 5.1 and 5.2 illustrate the final distribution of clusters in both cities together with the prevalence of each class in the sample and the values of the variables estimating the clusters. The left-hand side lists the categorical variables used to predict the latent class variable. Next to each categorical variable are the estimated probabilities of these conditions occurring, which are conditional on latent class. Immediately below the latent classes, we can see the estimated relative size of each latent class. The analysis was run separately for Amsterdam and Strasbourg, using almost identical variables. Interestingly, similar clusters emerged with distinct distributions in each city. The most prevalent class of active respondents in Amsterdam is latent class two (stable transitions), while in Strasbourg both latent class one (shifting transitions) and latent class two (stable transitions) have similar proportions. Most respondents in the “early stable” category were still working in their first job and had managed to achieve a degree of stability. In Amsterdam, respondents had a higher probability of having been out of school for more than 5 years than in Strasbourg. In Amsterdam the members of this latent cluster had a high estimated probability of wanting to continue in their current jobs. The transitions of respondents in this cluster most closely resemble the “traditional biographies” identified in previous studies (Evans and Heinz 1994), in which young people follow institutionally designed pathways from school to work and then stay in their first job. Despite having had a few jobs since leaving school, the respondents in the “stable” cluster had achieved the most stable positions. In both settings, they had the highest likelihood of being employed on a permanent contract, of having done the same job for more than 3 years and having been offered a promotion. The major contrast between the two settings was the satisfaction rates: while nearly all of the respondents in Amsterdam were satisfied with their careers, respondents in Strasbourg had the highest estimated probability of being dissatisfied compared to active latent classes 1 and 3. This finding is hard to interpret solely on the basis of the quantitative research, so it will be explored in more detail through the qualitative interviews. This latent class is similar to the “stable transitions” defined by Bradley and Devadason (2008) and the “smooth” transitions defined by the YOYO study (Walther et al. 2006), whereby young people have a few jobs before settling down in one. Members of the “shifting” cluster had the lowest likelihood of having achieved permanent job contracts. They also had a high estimated probability of having left school more than 5 years ago. They had also the highest estimated likelihood of being unemployed longer than 3 months in both settings. Once more, there was a discrepancy with regard to satisfaction rates between the settings, and the qualitative interviews helped to interpret the mechanisms and motivations behind these shifting transitions. The estimated probability of being dissatisfied was higher in Amsterdam than in Strasbourg. This latent class resonates with the “shifters” identified by Bradley and Devadason (2008): young people who had not been able to pursue a stable pathway in their labour market careers. The inactive respondents were grouped according to the duration of their unemployment and plans regarding employment in the future (see Table 5.2). Although the characteristics of the “inactive” cluster differ distinctively between the settings, there is one overlapping characteristic: respondents in this group, both in Amsterdam and Strasbourg, are not planning to work in the near future. In Amsterdam, this group had a high probability of having been out of school for longer than 5 years and unemployed for longer than 12 months. Respondents from this group in Strasbourg were less likely to have been unemployed for longer than 12 months. Members of this cluster in Amsterdam also had a higher estimated likelihood of being homemakers than their peers in Strasbourg. These inactive respondents most closely resemble what Plug and du Bois-Reymond (2006) labelled “unknown/other” transitions, whereby young people left the labour market after getting married. Members of the “stagnant” cluster had a high estimated probability of having been unemployed for longer than 12 months while actively seeking work. Young people in this cluster had a high likelihood of having worked before. The distinction between the two settings was that the respondents in Strasbourg also had a high estimated probability of being homemakers. Previous studies have defined stagnation as shifting between unemployment, employment, and training without any overall improvement in career stability (Evans and Heinz 1994; Plug and Bois-Reymond 2006). However, such a judgement cannot be made for this cluster on the basis of the quantitative findings alone. These respondents’ transitions were termed stagnant due to extended periods of unemployment despite their willingness to work. The mechanisms and motivations underlying this will be explored through the qualitative profiles. The “in-transition” group was characterized by having been out of school for less than 5 years and expressing a willingness to work. Hence, their condition is interpreted as being transitory compared to other profiles who had a higher likelihood of having been out of school for longer. This group also had a higher likelihood of short-term unemployment: the majority had a high estimated probability of being unemployed for less than 12 months. This group had no probability of being homemakers and all were willing to work. The members of this class were either new to the labour market or between jobs at the time of the interview. The transitions of this group could just as well be described as “shifting” or “stable”, as they may have been just changing jobs to forward their careers. This cluster will be better understood by examining the qualitative interviews, which will reveal whether they had extended or persistent periods of unemployment. Tables 5.3 and 5.4 illustrate the estimated number of respondents from both the focus and control groups falling under the identified latent classes. They also showed that early stable and stable transitions (in total for both groups) were more prevalent in Amsterdam than Strasbourg. 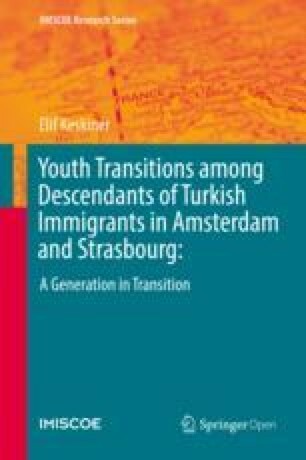 Tables 5.3 and 5.4 show that, among the active trajectories, the native-born descendants of Turkish immigrants were more represented in shifting transitions both in Amsterdam and Strasbourg, though to varying degrees: in Amsterdam, 24% had shifting transitions compared to 13% in the comparison group, while, in Strasbourg, these figures were 45% and 27% respectively. Tables 5.3 and 5.4 show the distribution of the latent classes by gender. Female native-born descendants of immigrants are more likely to have inactive trajectories in Amsterdam than in Strasbourg. However, in Amsterdam females active in the labour market are more likely to have early stable transitions and less likely to have shifting transitions than males, who have the highest incidence of shifting transitions in Amsterdam (see Table 5.3). A covariate which could also be crucial to understanding group differences is the distribution of education level across the latent classes. Previous studies have highlighted that instability is not limited to less-educated groups but is also increasingly experienced by those with higher education qualifications (Bradley and Devadason 2008; Fenton and Dermott 2006). Table 5.5 illustrates the distribution of educational attainment across our latent classes and all respondents. Of those in shifting transitions, 30% in Amsterdam and 34% in Strasbourg have tertiary degrees. In both settings, the majority of those in stable or early stable transitions hold tertiary degrees, while those in inactive and stagnant transitions predominantly hold lower qualifications. Another approach is to check the distribution of latent classes across education levels. Table 5.8 in Appendix in this chapter shows that the majority of tertiary degree holders were in either early stable or stable transitions in both settings. However, the distributions were different in each setting; while 84% of tertiary degree holders in Amsterdam achieved either stable or early stable transitions, this figure was only 51% in Strasbourg. In Amsterdam, the majority of those with a vocational diploma achieved early stable or stable transitions (66%), whereas in Strasbourg 35% of vocational diploma holders achieved a form of stability. On the contrary in Amsterdam those who dropped out of VMBO had the highest rates of inactive or stagnant transitions compared to other diploma holders. This descriptive comparison confirms our discussion of educational credentials and their returns in Amsterdam; those who hold tertiary degrees and vocational degrees have higher likelihood showing early stable and stable transitions in Amsterdam compared to Strasbourg. When compared by education level, young people with higher degrees in Strasbourg had less stable transitions compared to their peers in Amsterdam. I have also checked what kind of jobs the respondents were referring to in these typologies. In order to highlight what kind of jobs we are talking about when referring to stable or early stable careers among the active profiles, the latent class variable was cross-tabbed with the ISCO codes.2 Accordingly among the group stable transitions in Amsterdam, only 5% of native-born descendants of immigrants from Turkey worked in managerial positions compared to 15% of the comparison group. Of the other descendants of immigrants from Turkey in stable transitions, 24% were technicians and associate professionals, 24% were clerical workers, and 20% worked in the service sector (including small shop owners and entrepreneurs). In Strasbourg, among the native-born descendants of Turkish immigrants, only 7% of the early stable transition holders reported having a managerial position, compared to 8% of the comparison group. Once more, the largest group of native-born descendants of immigrants from Turkey with stable transitions were plant and machine operators in the manufacturing sector (31%). Among the comparison group, 13% of stable transition holders held managerial jobs and 46% were in professional occupations. This occupational status scheme illustrates that achieving stability doesn’t necessarily mean that young people hold managerial or professional positions. As we will see in the qualitative interviews, some respondents were “fixated” in dead-end jobs with no opportunity for promotion, whereby some were motivated to leave their jobs, while others decided to remain. The findings from the quantitative analysis uncovered trends both in relation to the contexts and the groups. First of all, the distribution of transition typologies varied between the settings. When no distinction was made between the native-born descendants of Turkish immigrants and the comparison group, we observed that a greater number of active respondents demonstrated shifting transitions in Strasbourg (37%) than in Amsterdam (17%). Those with either early stable or stable transitions were still the largest group in both settings but were more numerous in Amsterdam (83%) than in Strasbourg (63%). Hence respondents from both groups in Amsterdam had a higher probability in achieving in stable and early stable careers compared to those in Strasbourg. When we look at the comparative distributions across groups, we see a higher incidence of shifting careers among the native-born descendants of immigrants from Turkey than among the comparison group in both cities, but once more, this figure is higher in Strasbourg. Among the inactive profiles, there are more native-born descendants of immigrants from Turkey in both settings. With regard to gendered distributions, we have seen that female descendants of migrants were more likely to have inactive careers compared to male descendants of Turkish, but when they were active they were to be found in greater numbers in early stable and stable careers (combined) than the males, especially in Amsterdam. In Strasbourg, male and female descendants of migrants were almost equally represented in shifting careers among the respondents active in the employment market. 35% of the Turkish origin women were in inactive careers, compared to 21% of the men. 70% of the females had either inactive or stagnant careers in Strasbourg. The distribution of transition trajectories also varied according to respondents’ educational careers. The majority of the stable and smooth transition holders in both Amsterdam and Strasbourg possessed tertiary education diplomas. However, a considerable number of highly-educated respondents had a shifting status, in line with previous findings that shifter careers are not only found among the less educated (Fenton and Dermott 2006). Nevertheless, those respondents who dropped out of lower secondary education without a minimum qualification (VMBO or collège certificate) experienced the highest rates of inactive or shifting transitions both in Amsterdam and Strasbourg. This finding suggests that “shifting transitions” are not desirable “alternatives” but more inevitable outcomes of stagnation. Age also turned out to be a significant marker as the likelihood of having a stable career increased with age in both cities. The next section will focus on the transition narratives of the respondents in the qualitative interviews, who were also sampled from the TIES survey. This data will help to unravel the mechanisms behind their transition processes and flesh out the transition typologies produced by the quantitative analysis. Each of the qualitative interviews has been analyzed to explain how it corresponds to the typology. Clearly, the qualitative interviews generated deeper insights into respondents’ employment trajectories and their subjective evaluations of their experience. Respondents explained in detail why they considered or refrained from changing their jobs; why they were satisfied or dissatisfied with how their careers had turned out; how they evaluated labour market conditions and the impact they had on their transitions; the extent to which they embraced flexibility and what they thought of all this. Profiles from the qualitative interviews are provided below in Table 5.6. First, I will define the early stable and stable transition types. As they are closely related to each other, their differences will be unravelled and their similarities highlighted by examining how they interact with the different structures in each setting. Secondly, shifting transitions will be presented. Since the qualitative interviews provided rich information on labour market experiences and orientations, those who experienced “in-transition” careers are also considered as belonging to this category. Next, shifting transitions will be compared with “stagnant” careers. Finally, we will concentrate separately on inactive careers. Most members of this group in the qualitative sample are young women who had withdrawn from labour market activity to become homemakers. Our quantitative analysis categorized respondents as demonstrating early stable transitions if they had remained in their first job after leaving school, and as having stable transitions if they had had a few jobs (but not many) before settling in one. In our qualitative interviews, we categorized our respondents as having early stable or stable transitions based on their employment history and their motivation for remaining in their jobs. These two transition typologies are reminiscent of the smooth and traditional transitions defined in the literature (Evans and Heinz 1994; Plug and Bois-Reymond 2006). In that sense these young people followed institutionally defined pathways of going straight from school to a job related to their studies, especially in Amsterdam. The former group continued to work for their internship company after graduation (early stable) or found a job via contacts they had made during their studies. In contrast, those in stable transitions had taken longer to find a job or had had a few jobs before finding a steady job. The interviews revealed that these young people wished to remain in their jobs for a number of reasons: some were afraid of unemployment due to the economic crisis, and responsibilities such as marriage, children and mortgage payments were also mentioned as incentives. Those in stable transitions were also motivated by the memory of their prior shifting careers and a desire to settle in at their job. Below we will look at two profiles that best illustrate the salient details of these forms of transitions: the first is of Tülin from Amsterdam, who experienced an early stable transition, and the other is of Deniz from Strasbourg, who was in a stable transition. Tülin was born and raised in Amsterdam. At the time of our interview she was living in the north of the city together with her husband and her 6-month-old baby boy. Tülin’s father had moved to the Netherlands at the age of 17, along with his father who was a guest worker. Tülin’s father had a primary school diploma from Turkey, and acquired some proficiency in Dutch. He did all sorts of unskilled jobs, such as cleaning and newspaper delivery. At the time of the interview, he was working as a taxi driver along with many of her other relatives. Her mother came to the Netherlands to marry her father and had never worked outside of the house. Tülin was their eldest child and had two younger brothers. Tülin talked positively about her education. She was a well-behaved pupil who got on with her teachers and achieved average grades. However, she was often unable to concentrate at primary school, as her mother was ill, and after getting a low CITO score, she was advised to follow a vocational track. Tülin had wanted to attend the general academic track, but her grades were not good enough. Her teachers tried to comfort her by saying she could always pursue further education in the future. Gender influences could be observed in Tülin’s choice of vocational subject (Gaskell 1992). She had always dreamed of becoming either a flight attendant or a nurse as she liked the atmosphere in airports and in hospitals. Unsure of which to study, she attended career information days where she discovered that working as a flight attendant would mean learning several foreign languages and working long, irregular hours. She decided that this profession would be too arduous and difficult to combine with family life, something she also aspired to. She therefore did the healthcare track at vocational school and upper secondary education and became an assistant to a general practitioner. Tülin said that although her parents did “not get involved” in her education, they nevertheless supported her decisions. Nobody else in her family had ever had such a job and Tülin’s mother had neither worked nor learnt to speak fluent Dutch. As her father had not offered her much guidance, she had had to steer her own course. Her parents supported her decision to become a doctor’s assistant rather than a stewardess, as they considered this a more suitable profession for a woman. During her post-secondary vocational training, Tülin conducted two internships that proved instrumental to her future career choices. The first was in an administrative office at a hospital, where she answered the telephone and recorded patient information. The second was as a doctor’s assistant in a GP’s practice, where, in addition to administrative duties, she also performed minor nursing tasks, such as taking blood samples and giving vaccinations. She enjoyed this internship much more as it allowed her to use skills she had learnt at school. Both internships provided Tülin with cultural capital comprised of insider information about labour market expectations and occupation-specific tasks. After Tülin finished her training, she opted to stay on for another year to obtain her MBO N-4 diploma, as this provided access to vocational tertiary education (HBO). In terms of financial capital, Tülin’s father earned enough to support her education and she did not have to take many student jobs. At one point she was able to stop working to concentrate on her studies. She eventually decided to pursue her long-delayed ambition to enter higher education. With a close friend, she visited open days organized by higher education institutions and they both enrolled in a social work (maatschappelijk werk) course. However, this study did not fulfil Tülin’s expectations, and she dropped out 2 months later to avoid having to repay her student loan. As Tülin had not enjoyed her internship experience in the hospital, she started looking for a job as a GP’s assistant in Amsterdam. After about 2 months, she applied for a post and was called in for an interview. She was up against other Dutch women, who were older and more experienced, but thinks that she got the job because she was younger and looked more open to learning and adjusting to the workplace. At the time of the interview, she had been working there for 3.5 years and had secured a permanent contract. The year after she started her job, she got married to a Turkish immigrant who had arrived in the Netherlands at the age of 15 and was working nights as a taxi driver with her father. They found an apartment in a social housing complex in North Amsterdam, and she became pregnant the following year. After her son’s birth she worked part-time while he adjusted to day-care. Tülin was quite satisfied with her job. She liked her work environment and said that the doctors and most of her colleagues were friendly. Nevertheless, she had experienced a few distressing incidents, especially after announcing her decision to wear a headscarf at work. Tülin had not worn a headscarf when she applied for the job. She had started wearing a headscarf in lower secondary school (VMBO) at the age of 14, but took it off again when she was 18 as she did not feel ready to take this step. She decided to wear it again 1 year after she started working. She emphasized that her workplace was open to such practices as her Moroccan colleague already wore a headscarf. Nevertheless, once she made up her mind, she informed her colleagues beforehand to avoid potential reactions when they saw her with a headscarf the next day. TÜLIN: Where I work, they really value one’s physical appearance and how one looks. I have long, black, curly hair and you know it is different from short blond hair, so they really like that and they would always compliment me. Back then everything was pleasant and happy... until I decided to wear a headscarf. INTERVIEWER: Is there anyone else wearing a headscarf in the workplace? TÜLIN: Yes, yes there is one; a Moroccan girl. She also decided to wear a headscarf after she started working and she has been (working) there for over 10 years now. I mean, they think that we put on the headscarf when we are about to get married or after we get married because our husbands want us to. They have this stuck in their brains. Anyways, once I had decided, I started telling them, “I am considering wearing a headscarf,” so they wouldn’t get a shock the next day when they saw me wearing it and wouldn’t react badly. Because, you know, I have this thing; I just can’t keep my thoughts to myself; if I am confronted with something I react very harshly. But I also didn’t want to experience this or any kind of confrontation at work. Then I was ready; I went with the headscarf. My close friends from work [the Moroccan lady and another Dutch colleague] already knew. However, other people’s reactions were not as easy-going as she had hoped. Some of the doctors made fun of her, while others questioned her decision. One doctor confronted her during the weekly workplace meeting, but later apologized for her behaviour. Eventually, her colleagues got used to her new look. Tülin wanted to stay in her job, even though it did not offer any prospects for promotion. She enjoyed the work environment, the work itself and the flexible working hours, which were important to her since becoming a mother. However, she felt that she wouldn’t have been hired if she had worn a headscarf to the interview. Considering the difficulties of getting her headscarf accepted in a work environment where she was already well-liked and trusted made her question how easy it would be for her to find another job. Hence, Tülin’s unwillingness to risk a change and her desire to maintain a stable position and hold on to her job was prompted both by positive and negative experiences. Tülin also explained that the conflict over her headscarf was an issue of physical appearance rather than of religiosity. In fact, she reported that her colleagues thought it was a shame that she had covered “such beautiful hair”. She rejected this, saying “I hadn’t shaved my head; I was just covering it, and it was not their business what I do with my hair!” The importance of physical appearance in the workplace was brought up repeatedly by many respondents. Many realized after entering the workforce that their looks were crucial to gaining acceptance in the workplace. Young people in both France and the Netherlands talked about the importance of their name and appearance at work. Both gender and religion played an important part in shaping Tülin’s decision to stick at her job: young Muslim women wearing a headscarf often reported negative labour market experiences in both settings, although this was harsher in Strasbourg as was discussed in Chap. 3. Deniz was born and raised in Strasbourg. Her father was a labour migrant who later worked as a house painter on construction sites. Her mother was a homemaker and had never worked. Deniz had one older sister and a younger brother and sister. The family lived in a social housing complex situated in a majority-minority neighbourhood (quartier) of Strasbourg. Deniz persevered throughout her education and studied hard to achieve her aim to attend higher education. Her parents were fully supportive of her efforts and even though they did not possess the cultural or social capital to provide her with instrumental guidance or contacts, they created an emotionally supportive environment (Reay 2004). After lyceum, she decided to study at a vocational college (BTS) rather than a (non-selective) university. It did not even cross her mind to apply to a prestigious university (grande école). Vocational colleges required only 2 years of training and Deniz felt that they provided clear occupational trajectories and better job opportunities, while university would take 4 years and seemed a more demanding and uncertain pathway into the labour market. Deniz thus didn’t feel confident enough to risk going to university. She majored in administration and secretarial studies as she thought that this would provide her with the most flexibility and the largest range of job options. After graduating, Deniz embarked upon a serious job search. As her family had no computer at home, she registered with employment agencies and went there every day to ensure she was the first person they contacted if a vacancy came up. After 6 months, she found a 4-month administrative position at a high school to replace a colleague who had gone on maternity leave. Even though this post meant a 2-h bus commute every day, she accepted it to gain work experience. After 4 months Deniz was back on the job market. She continued to visit the employment agencies and would also go to her best friend’s house to use her computer and internet. Her friend’s parents were immigrants from Morocco. One day, her friend’s older sister, who was a law student in Strasbourg University, informed her of a position in a notary’s office that a French classmate had told her about. This experience illustrates the strength of the weak ties postulation (Granovetter 2005), which argues that weak connections with majority groups provide more resources in labour markets than strong ties within a closer circle. This job was not advertised in the newspaper or by employment agencies, but was spread by a few law students through word of mouth. That night, Deniz phoned the notary to make an appointment first thing Monday morning. At the interview, she was told that this job was once more a temporary, four-month position to replace a colleague on maternity leave. This did not deter Deniz and she was accepted. This job was a much more challenging position than her previous position. As a notary’s secretary, she had to learn many new rules and regulations. Furthermore, she found herself in a stressful and demanding working environment with colleagues who were neither friendly nor helpful. In her first months, her colleagues asked her to do all sorts of errands and legwork that were not part of her job description. Once more, Deniz demonstrated her perseverance and willingness to work hard. Her determination did not go unnoticed, and, 2 months later, her boss offered her a full-time position, followed by a permanent contract (embouché) 1 year later. Nevertheless, she still felt challenged, saying that she had been learning the tricks of the trade since day one. For example, soon after she started working she realized that one’s physical appearance was crucial to success in the workplace. After some nasty comments from her bosses, she adjusted her looks and clothing. Her experience in the solicitor’s firm also convinced Deniz that contrary to what she had been taught at school, not everybody had equal opportunities on the labour market. DENIZ: You know, I never cared about discrimination; I never gave it any thought. I thought it didn’t exist—at least before I started working here or entered the labour market. Our teachers always told that us that if you want to go high and make it in the labour market, your qualifications hold the key to success. But my labour market experience proved that even if you have qualifications, they are not enough … My boss told me this, I heard it with my own ears. He asked me, “Why do you think I placed you in the back desk and not in the front desk?” This was three weeks after I started working here. First I cried a lot and I couldn’t reply, you know, I couldn’t say anything. And then he said “I am not racist, but you have to understand I cannot risk my clients seeing you when they come here.” I mean you see where my room is? It is located exactly opposite the lift. So what diploma? I mean I was still lucky that they gave me a job, but would you be surprised if they took someone French instead? These worries made Deniz stick at her job and not try her chances elsewhere. She had been doing the same job for 4 years and had secured a permanent contract. Her job was still stressful and demanding and she still had a hard time getting herself accepted by her colleagues, but her permanent contract meant that she had stopped caring so much. In time, her bosses had begun to invite her to social events, though selectively. She still felt out of place on occasions such as dinners with customers or parties, where other people drank alcohol and she didn’t. Yet she also felt more equipped to “manage” these occasions. Her ambition was to get promoted to the position of clerc de notaire; the highest-ranking solicitor’s secretary. Although she feared that her lack of legal training would stand in her way, she had confidence in her potential and abilities. The fact that she was handling the sale of a €30 million property deal was proof of her boss’s faith in her. In order to work her way up through the company, Deniz had to be extremely dedicated and hardworking, making sure to avoid mistakes. She had started off just above the minimum wage (bruto SMIC) of around €1400, but this had been increased to around €1800 net. She was quite happy with her current salary, and was planning on buying an apartment with her savings. In the initial interview, Deniz’s main concern was marriage, as she was 27 and still single. The age of marriage was quite young in Strasbourg and most of her friends were already married with children. She described postponing marriage as the greatest price she had paid for her successful career, and worried that she might miss out on having a family. In the follow-up interview 1 year later, she told me that she had been passed over for promotion to clerc de notaire for another colleague with a law diploma. She was very disappointed and felt betrayed, as one of her bosses had promised her the position. Yet she still did not plan on changing her job. Instead she had modified her behaviour, exerting herself less at work. She said that she now stuck to her working hours and left at 17:00 like the other employees. She no longer made extraordinary effort to prove herself. These two profiles are revealing in terms of attitudes towards stability and transition. Tülin’s case can be taken as a typical example of a smooth or traditional transition (Evans and Heinz 1994), leading to a stable labour market outcome as well as a smooth entry into matrimony and starting a family. Even though Tülin tried a few options during her vocational tertiary education, it is hard to describe this as a form of shifting or risk taking, as this is becoming increasingly common among many vocational track students. Moreover, after her brief foray into higher education, Tülin returned to her institutionally designated pathway. The juxtaposition of Deniz’s and Tülin’s cases also illustrates the role that options for promotion play in young people’s orientations. For those with vocational degrees, low occupational status and meagre promotion prospects, a permanent contract is a desirable end result. The only other option is to start their own business. Deniz also had other incentives to stay in her job: first of all, it had taken her nearly 2 years to find a full-time position. This was largely due to the major differences in labour market conditions between Amsterdam and Strasbourg. Even though Tülin only had a vocational diploma, she was able to make a much smoother entry into labour market than Deniz, who had a tertiary vocational education degree. Such difficulties were also encountered by many other respondents in Strasbourg. This suggests that one significant difference between early stable and stable transitions is that young people in stable transitions have often had negative labour market experiences that encourage them to remain in their current jobs. Deniz’s desire for stability was not only related to her marital status but also to her precarious position at work and the harsh labour market conditions in Strasbourg. One other point I would like to underline is the potential influence of workplace experiences. Both Deniz and Tülin had had unpleasant experiences and had been forced to justify their religion or physical appearance. Tülin had to deal with the impact of her decision to wear a headscarf on her relationship with her colleagues, and this made her reluctant to try her chances elsewhere. Despite the fact that her workplace was in west Amsterdam and served a majority-minority clientele accustomed to Islamic dress codes, she doubted that she would have been hired if she had worn a headscarf to her job interview. This made Tülin wary about the job opportunities that would be available to her should she wish to leave her current position. In a similar vein, Deniz’s experience of being hidden away in the solicitor’s office taught her about the problem of prejudice in the labour market and put her off looking for a job at a different solicitor’s firm, even though her hopes of promotion at her present workplace had been quashed. Respondents in shifting transitions experienced frequent job shifts and unemployment, and therefore had not been able to find a steady job. In this section we will compare three profiles in different settings: two active and one unemployed. However, even though the unemployed respondents were not working at the time of our encounter, they had previously shifted between jobs and statuses. Cengiz’s father migrated to Strasbourg as a guest worker and was later joined by his family. He had not completed primary education and worked in construction. Cengiz’s mother had no education at all and she was occupied with household duties. The couple had five children. Both Cengiz and his younger brother were born and raised in France. His older sisters stopped studying because of the headscarf ban in France. Cengiz had been married for 6 years and had two daughters. His wife was from his parents’ village and migrated to Strasbourg when they got married. They were living in a social housing block in one of Strasbourg’s majority-minority neighbourhoods. Cengiz was good at school, particularly at mathematics. Despite his high grades, his father advised him to take up plumbing to gain a trade after observing that plumbers in the construction business were never out of work. Cengiz wanted to become a mechanic, but his mother opposed his decision, saying she didn’t want him to come home with oily clothes. Following his family’s wishes, he studied plumbing at vocational college. Cengiz’s choice was thus both gendered and family-driven. Vocational training was not challenging for Cengiz, and he achieved very high grades without effort (he actually found the course less challenging than secondary education). During this period, his family opened their own supermarket and Cengiz started working in the family business in his spare time. At the end of Cengiz’s vocational training, his grades were so exceptional that his teachers advised him to go to lyceum. He enrolled at professional lyceum but found it difficult to combine his now more demanding studies with working in the family business and playing football in the semi-professional league. In the end, he decided to drop out of school for good, as he had a trade to fall back on. However, his vocational training in plumbing had included only short and infrequent internships through a customer of his family’s supermarket, and most of his work experience had been gained in the supermarket. Upon leaving school, Cengiz did not seek work in his chosen profession, but signed up with employment agencies and did whatever unskilled job came along. For the first 2 years, he worked on an assembly line in an automobile factory via an employment agency contract that was renewed every few months. During that period, he got married and he and his wife continued to work in the family business alongside his job in the factory. He enjoyed working with machinery in the automobile factory, but when he left work for a month so that the family could visit Turkey, his position was no longer available upon his return. He then found work as a deliveryman for a courier company, and enjoyed the driving and mobility. However, he quit this job after receiving so many traffic tickets that he was in danger of losing his driving license. He returned to the employment agency, finally getting a job in a large plumbing company of 150 employees that served the construction industry in Strasbourg. At the time of our interview, he still did not have a permanent contract, despite having worked there for three and a half years. He was still on short-term contracts provided through the employment agency. Since leaving education, Cengiz had been registered with an employment agency (interim) that outsourced unskilled or low skilled jobs. In 8 years of employment, he had not once been offered a permanent contract. His contracts were automatically renewed every one or 2 months because a six-month contract would oblige his employer to offer him a permanent contract (embouché) when it expired. Cengiz didn’t express any resentment about having a temporary contract, as a permanent contract wouldn’t mean a drastic change in his income, which was €1400 a month, just above the minimum wage (SMIC). His current job required him to work under very difficult conditions and was physically demanding. Nevertheless, he planned on pursuing it as he did not want to risk becoming unemployed during an economic crisis, even though he had never had any difficulty finding a job up until that point. He said that he might consider starting his own company, but was in no hurry. The family business seemed also a burden to him, as he and his wife had to work weekends and holidays in the supermarket. Cengiz had thus shifted between various, mostly low-skilled, jobs and had not yet found stability in one job or career. He also had no clear plan about what to do next. One striking factor in the precarious nature of Cengiz’s jobs was the role played by employment agencies. The constructions offered by these agencies allow employers to transfer almost all of their employer’s risks to their employees, who could be fired every other month. Furthermore, Cengiz felt entirely responsible for taking care of his family, as his wife was not employed, and tried to avoid unemployment by accepting any job that came along. Emre’s father had arrived in the Netherlands at the age of 15, along with his father who had been hired as a guest worker. He spoke Dutch and had worked as a driver for 20 years but had been on sick leave for 5 years at the time of the interview. Emre’s mother came to the Netherlands to marry his father. She had obtained a vocational degree in Turkey and worked as a Turkish language instructor in primary and secondary schools in Amsterdam for many years. She became unemployed after Turkish language teaching was dropped from the state curriculum. Emre’s mother was the most highly-educated mother in the qualitative sample. Emre’s older sister had recently graduated from tertiary vocational training. Emre grew up in the east of Amsterdam and attended school there. After scoring poorly in the CITO test at the end of primary school, he was advised to follow the vocational track. He had good grades in mathematics but had problems with Dutch language proficiency. He claimed that neither he nor his parents were informed about the implications of the CITO tests in primary school and was highly critical of the early stratification in the Dutch education system. In senior vocational training (MBO), Emre first enrolled in information and communications technology. However, 1 year later he switched to sales and commerce (handel). Like most of his peers in the Netherlands, Emre found a part-time job when he was 17. He switched between cleaning planes, working in the airport baggage section, and stacking shelves in supermarkets. While these jobs provided him with an income, they also affected his studies, though he successfully graduated from vocational college at the age of 21. He then registered at a tertiary vocational college (HBO) to study social work (maatschappelijk werk). Six months later he decided this was not the profession for him and dropped out. In the meantime, he continued with his part-time jobs and arranged his working hours around his studies, switching between full-time and part-time employment. After he dropped out of tertiary education, he looked for another job related to his sales and commerce course. He applied to a few stores and got a job at H&M in one of the busiest shopping streets in Amsterdam. However, the store was too hectic and the work too hard, so he quit after 4 months. He said that he could have become a store manager if he had stayed, but he didn’t like the job. He decided to return to education. This time he attended a tertiary course at an HBO in business administration and economics, which he thought would be a suitable follow-up to his vocational major. However, this programme was much more challenging than he expected, and once more he quit before the end of his first semester. In the meantime, he was registered in the employment centre, continued to live with his parents and do all sorts of service jobs to secure an income. At the time of our interview, Emre was unemployed after returning from his holidays in Turkey. He had just applied for unemployment benefit as he couldn’t find a job he liked. He had given up his last job, in a supermarket, after a couple of months to go on holiday. He was actively seeking work and hoping to hear from a friend who had promised to find him a job as a sales assistant in a mobile phone store. EMRE: Having an MBO diploma didn’t really give me an advantage. But maybe if I had tried harder it [having an MBO diploma] could have [helped]. For example, I worked in a clothing store. But I didn’t like it. It was so busy and you constantly have to tidy and fold stuff. Maybe if I had persisted I could become a floor manager or something. But I didn’t. It was so tiring. Now I am thinking of working in a phone store. I am not sure. Or maybe I will go back to school. I am thinking of starting in February. INTERVIEWER: Did you decide on what to study? EMRE: I am thinking of the HVA (Hogeschool van Amsterdam) I have studied there before. I also want to study, but, you know, it depends. I also want this phone business to come through. Emre was quite disappointed about how his transition had turned out. He complained that it was impossible to find a decent job, despite sending many applications, saying, “It’s easy to find a job; it’s hard to find a good job”. Furthermore he emphasized how hard it had been to find low-skilled jobs since the start of the economic crisis. Emre had been unemployed for 3–4 months and could therefore be consigned to the in-transition latent class. However, as he had still no job stability despite having left school over 4 years ago, he could also be said to be in a stagnant transition. Not only had he not achieved any stability in his career, but he had constantly drifted between periods of employment, training and unemployment with no clear direction and gave an impression of dissatisfaction and hopelessness. Although he had a vocational degree, this didn’t seem to provide any stability, as he did not know how to use it to find a job that he would enjoy doing. His attempts to enter vocational tertiary education also lacked focus. His situation seemed to be due to a combination of motivational and structural disparities. If we had interviewed him when he was working, however, he would have qualified as a shifter as he would have been shifting between statuses. Emre’s case is an interesting example in the Dutch context, as his vocational training did not lead to a significant development of cultural or social capital related to his studies. During his commerce course, he conducted an internship in the supermarket where he worked part-time. Therefore his networks and resources were derived from his student jobs. Neither Emre’s vocational training nor his attempts at higher education were a match with his ambitions on the employment market. Lehmann argues that occupation-specific vocational training lacks the flexibility that comprehensive systems provide: if you do not want to do work related to your qualifications or if you do not possess the resources and the cultural capital required for your occupation, you risk falling between the cracks (Lehmann 2007). Occupation-specific training provides an environment where many young people can extend their networks, learn more about their trade and discover what their future occupation will entail. Although Emre lacked this form of social and informational capital, he gained other resources through his work contacts that he hoped would help him to find work. Previous studies have defined stagnant transitions as those in which young people drift between employment and unemployment with no increase in stability (Plug and Bois-Reymond 2006). Bradley and Devadason’s (2008) shifters drifted between jobs, unemployment and training, either by choice or due to structural conditions. According to the latent class analysis, those with stagnant transitions had a high estimated likelihood of having been unemployed for longer than 12 months. In Amsterdam, none of the inactive interviewees had been unemployed for longer than 12 months. However, in Strasbourg, some female respondents who had never worked despite wanting to enter the labour market fitted these profiles. As the qualitative data provided more detailed information about past employment experience and motivations, it is possible to reorganize typologies rather than trying to strictly match the latent classes. In both settings, those who were unemployed usually switched between different jobs and statuses, similar to Cengiz and Emre. While Emre’s case suggests a lack of direction, others didn’t have the luxury of choosing a job or career pathway: instead they focussed on staying employed and acquiring a contract, if possible. As a result, those classed as stagnant or in-transition should be subsumed under the shifting category as they have not yet made a stable transition. This is also more optimistic than terming their transitions stagnant, as potentially they are open to change. According to our latent class analysis, there was a high estimated probability that respondents whose transitions had led to inactivity would be uninterested in entering the labour market. In Amsterdam, 60% of this category consisted of homemakers compared to 22% in Strasbourg. Even though many respondents were not active during the qualitative interviews, it is hard to place them in this category since they were motivated to work and some of them wanted to study. In order to grasp the motivations behind “not wanting to enter labour market”, this section will present the following trajectory, that of Kader. Kader had had a difficult home life. Her father had arrived in France as a guest worker in the 1970s, and was soon joined by Kader’s mother and disabled older brother. Tragically, Kader’s mother died while giving birth to her. Left with two small children to bring up, her father married a woman from his village in Turkey. Kader grew up with her stepmother and four younger step-sisters in a difficult family environment. School was a refuge from home and she was a good pupil. She put all her energy into her studies and did quite well in mathematics and French. Her education career looked bright until a confrontation over her Islamic practices with a secondary school teacher, who bullied her for wearing a headscarf and fasting during Ramadan. Her grades started to fall and eventually she lost interest in studying. At the end of collège, Kader was advised to attend the vocational track, and she agreed as she didn’t see much point in the academic track or university. She was happy to learn a trade and start working, so she chose textiles and sewing. However, this led only to dead-end jobs. Furthermore, work in the textile industry was located in the outlying regions of Alsace, and her father would not allow her to commute to work. Acting on her teachers’ advice, she went on to professional lyceum in commerce and sales, but dropped out before obtaining her baccalauréat diploma. By then she was 18 and as the eldest girl in the household, she was expected to get married. Kader was allowed to “choose” between two cousins: one from her father’s side and the other from her step-mother’s side. She chose to marry the latter in the hope of avoiding the birth defect caused by inbreeding that had resulted in her brother’s disability (her biological parents were also cousins). Once the couple were married, they had to work hard to survive. Kader got a job in a store but it didn’t last long as she was too shy to talk to the customers. She then did cleaning jobs along with her husband, and together they would clean schools, businesses, factories and stores. She continued working until she fell pregnant with her first child. She took a break from work but went back after the birth of her second child. Kader and her husband worked shifts and as their family did not help them with childcare, the children were left alone in the house for 1 h every day as her husband had to leave for work before Kader got home. They bought a phone with a screen so that she could talk constantly to the kids until she got home. At the time of the interview, Kader had four children; the third pregnancy had turned out to be twins. The family were living in a two-bedroom apartment in a neighbourhood infamous for its high poverty and crime rates. Kader stayed at home to take care of the children and had no interest in working as her only options were cleaning or other unskilled jobs. She didn’t have social networks that could connect her to better jobs. She and her husband had little contact with their families and preferred to keep it that way. Her husband was working on an assembly line on the outskirts of Strasbourg and had to cycle to work for 40 min every morning. Kader’s greatest ambition was for him to find a stable job. Kader’s case is extreme, but her story raises fundamental questions about the opportunities that education systems or labour market conditions provide for young people who have no support mechanisms at home. Kader sought refuge in school, but couldn’t find it there. Despite her vocational degree, the only work available to her was poorly paid and unpleasant. For Kader, work meant drudgery, an obligation she would rather avoid. Compared to Deniz, who had strong emotional support and financial capital at home, and Tülin, whose vocational educational trajectory built the cultural and informational capital she needed to enter the labour market, Kader found neither parental nor institutional support. Furthermore, as in the cases of Emre, Cengiz and Kader, Kader’s family lacked the cultural capital needed to help her find a suitable study programme or occupation. Almost all of the respondents in this study were motivated to seek stability in the labour market and wanted to pursue institutionally defined “traditional pathways”, prompted by both labour market conditions and job insecurity. Personal experiences of instability motivated them to stick at a job once they had secured a permanent position. Lack of security dragged other respondents into shifting transitions, not out of choice but born of necessity. In this way, their aspirations are similar to the “stickers” in Bradley and Devadason’s (2008) study and the “smooth transitions” in the YOYO study (Plug and du-Bois Reymond 2003), who wanted to keep their job and settle in a career. Although the respondents in both Strasbourg and Amsterdam had similar “stability” motivations, the nature of “stability” and transitions differed: the TIES survey analysis showed that the respondents in Amsterdam acquired stability at an earlier age than their peers in Strasbourg, who had longer periods of job searching and shifting before acquiring stability. Despite being in the labour market for considerable lengths of time (a minimum of over 3 years and up to 10 years in the interview profiles), shifters in Strasbourg still did not have a permanent contract. Qualitative interviews revealed that internship and student employment practices were instrumental to achieving early stability since respondents tended to stay with the same employer. Parental resources and the different forms and degrees of capital accrued during individual trajectories also proved instrumental during youth transitions. Following young people after they left school, we saw that those who were able to accumulate cultural and social capital through family, community or work experience contacts were also more able to acquire stable working arrangements. With regard to the lack of stability, while the latent class analysis distinguished stagnant and in-transition typologies, the qualitative interviews suggested that both categories could be subsumed under the shifting type, as the conditions of shifting between employment, unemployment and training, were similar for all the young people in these groups. This finding diverges from previous typologies of transitions, which also perceived shifting transitions as being “out of choice”, prompted by a desire to pursue alternative pathways (cf. Plug and du-Bois Reymond 2003; Bradley and Devadason 2008). In the case of my respondents, shifting was the result of precarious labour market conditions in which employment agencies provided jobs but no security whatsoever. Failure in the labour market nudged some respondents back into education, but as most of them had no clear direction this also failed to lead to a stable outcome for them. Even though Amsterdam provided more opportunities for stable transitions at an earlier age, transitions could be precarious and become shifting if one lacked the necessary education or cultural capital. An example of this is Emre from Amsterdam, whose lack of symbolic or cultural capital and a clear idea of what kind of work he wanted to do resulted in unstable conditions despite the institutional opportunities. Another interesting finding was that marriage patterns and family life often helped to sustain some sort of stability in the lives of inactive respondents, as Evans and Heinz (1994) have shown in their study on women from a working-class background in the UK. These profiles also showed that the choice to stay at home resulted from a lack of training opportunities and/or unpleasant working conditions. Rather than shifting between statuses, some young women preferred to stay at home and take care of their children in order to acquire a sense of stability and adulthood status. Among the respondents who sought stable transitions, I identified certain experiences specific to the descendants of immigrants. These were experiences of exclusion and discrimination in the workplace that have also been documented in previous studies (Waldring et al. 2015). Religion also played a role, and it was particularly difficult for young women wearing a headscarf to be accepted. Past experiences of discrimination or a lack of acceptance in the workplace informed these young people’s perceptions of conditions in the labour market. Hence, once they had secured a position they were inclined to stick at their jobs, rather than risking a new job or pursuing “alternative careers”. These findings can also easily apply to youth from lower social classes who also possess limited resources and have to deal with an insecure job market. While the concepts of alternative or shifting careers are interesting, researchers in the field of youth transitions should scrutinize them further in relation to social class, ethnicity and gender differences to see whether they apply to all young people and if so, under which conditions (Tables 5.7, 5.8 and 5.9). The descriptive trends were also checked with multivariate analysis. Binary logit models were used to estimate group membership for each cluster relative to being in other two clusters. The aim was to see whether being in one cluster is determined by having immigrant parents, gender, age, education level or parents’ education level. A few trends were observed. In the final models, age turned out to be the most significant determinant of having a stable career in both Amsterdam and in Strasbourg: the likelihood of being in a stable career increased along with age. In Amsterdam having a higher education degree (compared to a lower secondary qualification or less) was significantly negatively associated with having a shifter transition rather than an early stable or stable transition. Nevertheless due to the small case numbers these models are not presented in the current analysis. An analysis with a larger data set could provide a more robust analysis incorporating latent class variables. In social stratification research, job titles and occupational status are considered the primary measures of social position (Ganzeboom and Treiman 1996). The ISCO-08 codes are based on the skills needed for an occupation and the employment sector. The TIES dataset contains detailed job descriptions given by respondents about tasks performed in their current and previous jobs and the ISCO codes attached to these jobs. The ISCO codes are not a hierarchical occupational status scheme such as EGP codes or ISEI. However, they provide a descriptive tool to illustrate the different positions the young people had held at work. ISCO-08 categories are managers (chief executives, senior officials, administrative/ commercial/ services/ production/ retail managers) excluding small shop owners and entrepreneurs, professionals (science, engineering, health, teaching, business, administration, IT and legal, social and cultural professionals), technicians and associate professionals (technicians and science engineering, health, teaching, business, administration, IT and legal, social and cultural associate professionals), clerical support workers (general, keyboard, customer, numerical clerks and other clerical support workers), service and sales workers (personal service, sales, care, protective services workers), craft and related trades (builders and related trades workers, excluding electricians, metal, machinery and related trades workers, handicraft and printing workers, electricians, food processing and garment, craft and related trades workers), plant and machine operators and assemblers (machine and plant operators, assemblers, drivers and mobile operators), elementary occupations (cleaners and helpers as well as unskilled agricultural workers, street workers) (http://www.ilo.org/public/english/bureau/stat/isco/docs/resol08.doc).